Location: Northern Vesper, the Shrine of Sacrifice. 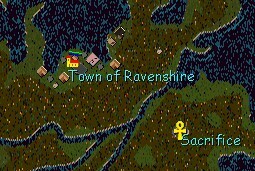 Affiliation: The Circle of the White Raven [CwR], the Town of Ravenshire [RvN]. Ravenshire was once a small, but vibrant community located in the verdant demesne north of Vesper, along the edges of the Great Loch. 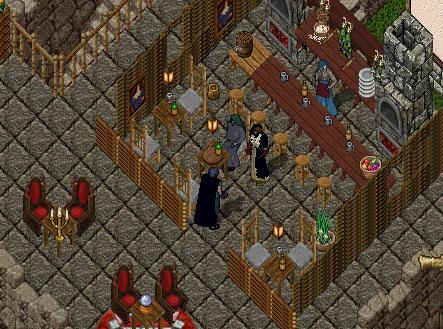 It was the scheme of a group of Druids and Rangers, known as the Clan of Keltic Knights, who sought to escape the dangers of the Old World and found their own, independent village outside the influence of Britannia and her corrupt High Council. The Villagers were mostly Pagans, and Druids, who kept to themselves and practiced the Old Ways, seeing their Mistress Bronwyn as the incarnation of the White Raven Goddess. Gypsies and others found a safe haven here, a sort of utopia where humans and elves could live side by side in peace, and where all religions could be practiced without persecution. Thus the Circle of the White Raven was born. But their time here was not always peaceful. The Shadow Imperium, led by the Liche Azalin Lore, sought to conquer Ravenshire and expand his vast Empire. If not for the aid of the Lumarians, Ravenshire might have burned to cinders at the hand of the Dark One. Ravenshire all but disappeared during the Age of Shadows, but some Villagers remained and clung to the hope that their Goddess might return to them. It was during the reign of Casca that Aldagar Morr, and a group of Inquisitors from a foreign land, subjugated the territory, and turned it into a place of evil and prejudice, driving out all that once was. But some whisper, it is only a matter of time before the Earth Mother returns to reclaim what is hers.